A poll worker places voting signs at Barrientes Middle School on Tuesday, Nov. 6, 2018, in Edinburg. 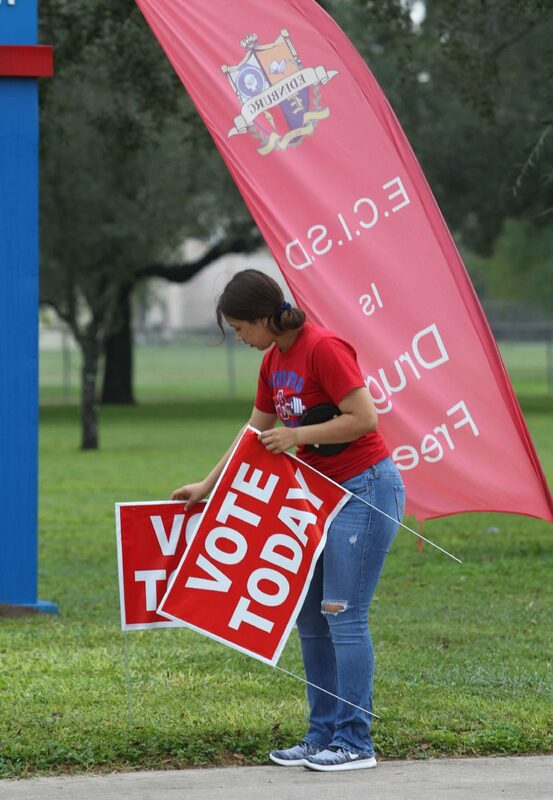 Edinburg voters passed three of four propositions Tuesday night, allowing the city to borrow $30 million for drainage and roadway improvements. Proposition A sought to change the way municipal judges are elected for the city of Edinburg. Council members wanted to have the power to appoint a judge, but voters turned that down by about 362 votes. According to unofficial results, 8,666 residents voted for the charter amendment, while another 9,028 voted against. Proposition B, which sought to implement term limits for elected officials, was passed with 11,368 residents voting for and 6,407 residents voting against. As a result, elected officials will be limited to two four-year terms. Any elected official who previously served will be allowed to run for one more term, while those on the council will be allowed to run two more terms. Proposition C, which sought approval to borrow $20 million for drainage improvements, narrowly passed with 9,415 votes for and 8,749 votes against. The funds will be used to construct four retention ponds throughout the city. Residents also narrowly passed Proposition D, which sought approval to borrow another $10 million for roadway improvements. It passed with 8,969 votes for and 8,941 votes against, a slim margin of 28 votes.